Based on historical responses and advanced natural language processing, our tool can suggest answers in your online discussions. Our AI Answers feature gets about 80% confidence so all it needs is a little human touch and expertise to save your webcare team’s valuable time. While addressing the online issues raised by the internet users in the SentiOne React module, you have now the possibility to select one of the most suitable answers. 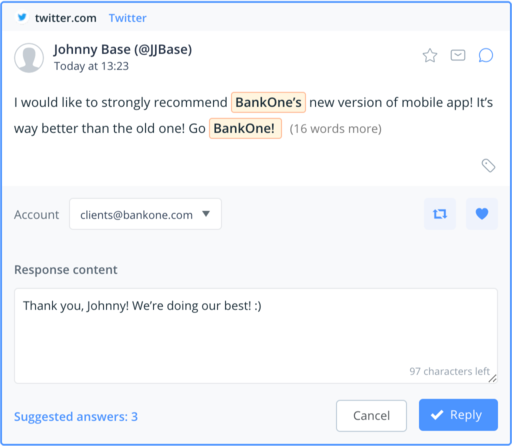 Every time an agent at your webcare team opens a new thread, our system offers three answers automatically. Click “Use” to choose the suggestion and customise answer if needed. Don’t worry - our system won’t let you send the message if it is not customised properly (you will have to fill in the brackets if there’s a name or any other specific information to be included in your answer).